This composite image shows the massive galaxy cluster MACSJ0717.5+3745 (MACSJ0717, for short), where four separate galaxy clusters have been involved in a collision, the first time such a phenomenon has been documented. 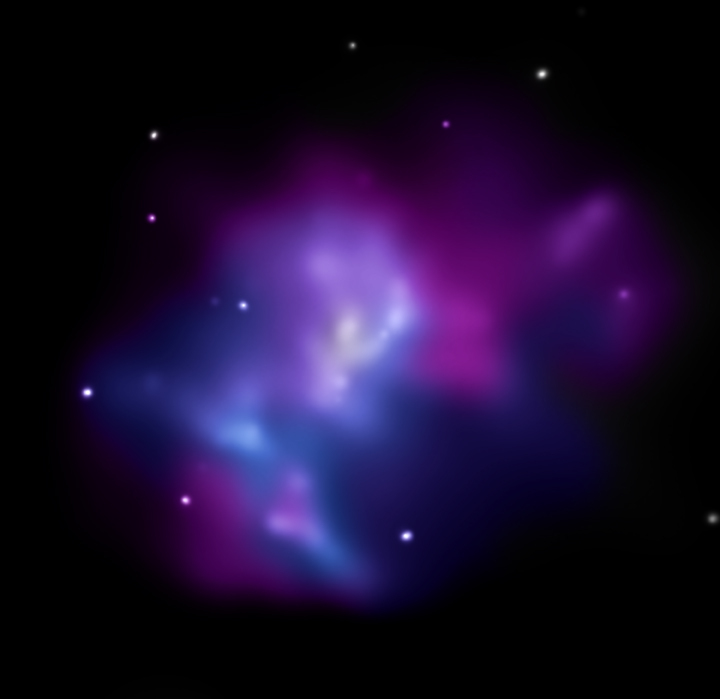 Hot gas is shown in an image from NASA's Chandra X-ray Observatory and galaxies are shown in an optical image from NASA's Hubble Space Telescope. The hot gas is color-coded to show temperature, similar to a temperature map of the Earth given in a weather forecast. In MACSJ0717 the coolest gas is shown as reddish purple, the hottest gas is blue and the temperatures in between are purple. The repeated collisions in MACSJ0717 are caused by a 13-million-light-year-long stream of galaxies, gas, and dark matter — known as a filament — pouring into a region already full of matter. A collision between gas in two or more clusters causes the hot gas to slow down. However, the galaxies, which are mainly empty space, do not slow down as much and so they move ahead of the gas. Therefore, the speed and direction of each cluster's motion — perpendicular to the line of sight — can be estimated by studying the offset between the average position of the galaxies and the peak in the hot gas. A labeled version of the MACSJ0717 image (roll your mouse over the image above) shows the galaxies in the four different clusters — identified by the letters "A," "B," "C," and "D" — involved in the collision, plus the direction of motion for the three fastest moving clusters. The length of the arrow shows the approximate speed in a direction perpendicular to the line of sight. Note that the direction of motion of the clusters is roughly parallel to the direction of the filament. Data from Keck Observatory was used to derive the speed of the clusters along the line of sight, allowing the three-dimensional geometry and dynamics of MACSJ0717 to be derived. The cooler (redder) region of gas towards the lower left of the cluster labeled "D" has likely survived from before the collision. Cluster A is likely falling back into the main cluster after already having passed through once in the opposite direction. Both of these clusters probably originated from the filament. Cluster B, however, has a much higher speed than the other clusters along the line of sight and its origin is unclear. It may have fallen along the outer edge of the filament, causing its infall trajectory to curve, or it may be falling in along another, smaller filament. The good alignment between the galaxies and hot gas for cluster C, along with its motion compared to MACSJ0717 as a whole, makes this system a good candidate for the core of the main cluster. The large region of relatively hot gas (shown in blue) that extends from the left side of cluster C to the right side of region D may be caused by heating as significant quantities of gas from the filament plough into the main cluster. MACSJ0717 is located about 5.4 billion light years from Earth. It is one of the most complex galaxy clusters ever seen. 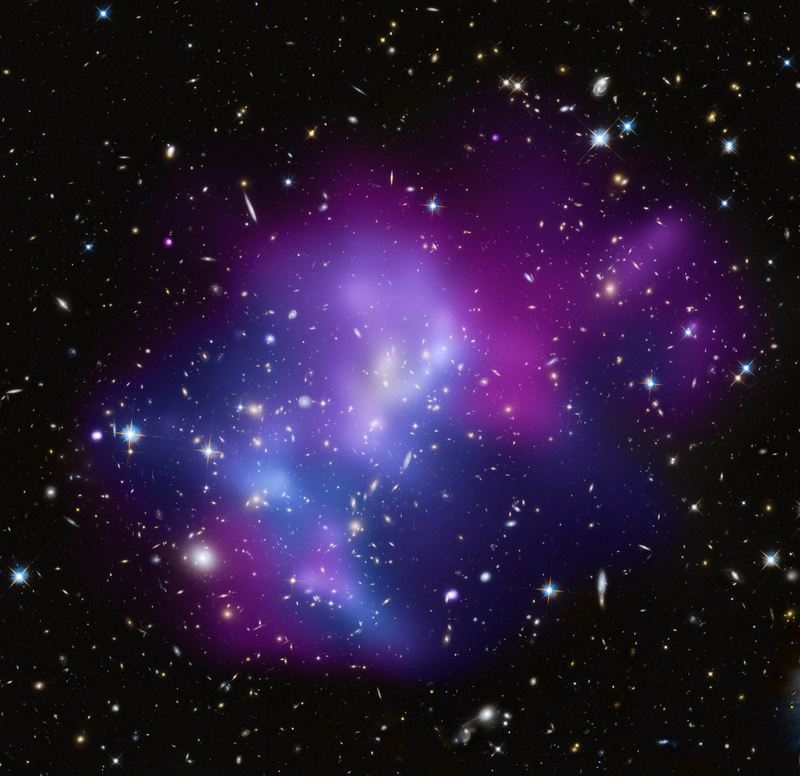 Other well-known clusters like the Bullet Cluster and MACSJ0025.4-1222 involve the collision of only two galaxy clusters and show much simpler geometry. Coordinates (J2000) RA 07h 17m 31.00s | Dec +37° 45´ 39.60"
The purple colors are very powerful, as you can see in the image, is it possible that purple hydrogen can form on the surface of each galactic star, so each galactic star can deviate stress, cure humans and help control every occurrence&quest; This is one of the best images I have ever seen. What is the 2 facts?